If you are looking for something new or the latest trend, you won’t find it here. Toronto marriage counselor Jack Mamo gives time-tested advice you can count on, because it’s proven to be effective. What’s new is how he has brought it all together in one volume, and written it from an authentically Christian perspective. 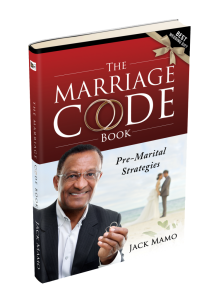 If you are Christian, there is a good chance that this book will help you grow in faith with the partner you choose, as well. The book is divided in two parts. The first part is all about choosing the right partner and avoiding the big mistake. Mamo takes you through the cold feet, so that you can make the commitment. He also takes you through the red flags that should give you cold feet, so that you can back away. The second part fast-forwards ten years to help you keep that marriage alive and well and “reclaim your wedding day glow”. Between the two parts, we get an inspired look at the wedding. Mamo helps us understand the meaning of the wedding (beyond the dress, the cake and the family politics), and the most vital part: the wedding vows. “Marriages fail. Perhaps it sounds alarmist to begin this book with a bleak and gloomy statement. I might just as well have begun by saying, “Marriages succeed,” right? You can pick up your copy at Amazon.com.